A mysterious android of unknown origin, The Pulse, as the news media called it, appeared near Chicago's Lake Shore Drive. Though it did not harm any civilians who looked on in shock at the strange machine, The Pulse proceeded to drain the entire downtown area's power grid. Police response was met with a wailing shriek that sent the police flying and overturning cars and waste bins. One unfortunate officer opened fire and was met with severe electrical shock to his body. And just as mysterious as it appeared, it vanished into a huge pillar of light. The incident was called "The Pulse Incident." From time to time, The Pulse would appear around different parts of the world, siphoning off energy from urban areas or power plants and defending itself upon confrontation. Though speculation runs rampant, no one truly knows what the Pulse is doing with all its stolen power, and even more terrifying, what would happen should it "accomplish" its unknown task? Abillities: The Pulse possesses a limitless capacity for energy absorption that it collects and regulates via the torso and various lights on its body. The Antenna on its head seems to be the Pulse's point of focus, as it is the first indicator of an attack as electricity flows from the antenna. With energy absorbed, the Pulse is capable of energy projectiles, teleportation, enhanced strength and energy conduction. 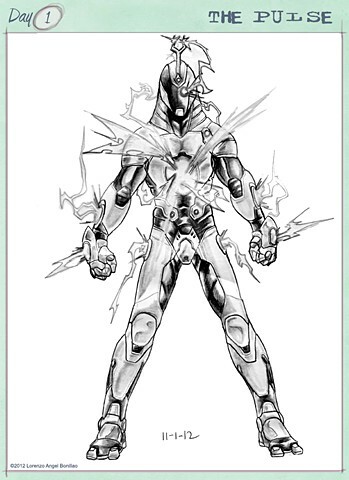 Inception: The Pulse was based on the design of Ultimate Captain Marvel from years ago. I've refined the idea over time to make it more machine than human, but kept aspects of Ultimate Captain Marvel while adding the new Iron Man suit. The energy pulse coming off its torso was an idea I thought of, as I pictured a machine that was a "walking EMP" yet contradictory,as it is a machine that shuts off other machines save itself. Or does it? The main purpose of this character is up in the air, as the premise is what I made of it and feel a mystery character will be fun to flesh out over time during an arc or a superhero campaign.